Historical authors jump through a lot of hoops to make certain that our stories jive with historical fact. Today I’m rebelling. Sometimes the facts were stinky. And for the moment, I’m tired of stinky! Here are some of the historical events that would have happened if I were in charge. I’ll have to wait until my time machine in the basement is finished before I can do anything about my list. But what about you, are there any historical events you would change if you could? If you're talking personal history... yup! ha ha, cute post Lisa! Though I would have missed seeing all those Titanic movies. I find that the things I would have liked to change in my own life were the very things that had to be there in order to make me grow as a person. I know the same thing is probably true of major historical events. They had to happen, but hey, if I didn't have fun pretending, I wouldn't be an author! Oh, and I thought of another one. Anne Frank's Famile Escape Capture. Hey, Lisa, I loved this. Great topic! It's too early in the morning for me to make up headlines (I'm supposed to be studying for a midterm exam) but my first historical event would be that Amelia Earhart was found alive and soaking up the sun on a tropical island. Historical event (travesty) that I would change if I could: I would love to go back and make it so that 9/11 never happened. Good ones, Suzie! And it's so good to see you here!!! I hope classes are going well and that you are seeing the light at the end of the tunnel. Lisa, I think exactly what you said about your own life, that the things you would change are actually the things that caused you to grow, are probably true of history as well. Like, first thing to pop into my head was the holocaust, but without it, would we now have a nation of Israel. What about 9-11? We might not notice it much here, but that day really turned the tide for people speaking out about Islam. Since that time, hundreds of thousands, if not millions of Muslims have come to Christ because people stopped being afraid to talk about the negative sides of that way of thinking. Of course, saving a few specific individuals along the way might be fun, but I don't think I'd want to risk changing any major historical events. Wow, this was a great post.I think though the that it is often the things that we would change are the things that have made us rely on God.More over circumstances seem to blind us at the time but then later we see what God was teaching us all along. Dina,brought up a great point about the Holocaust.Without the holocaust would we have such people like Corrie Ten Boom and her words of faith to inspire us as we face the trials of life. I pray that I never desire to change the things that God is trying to teach me. Wonderful post. Interesting ideas. I think we all have things we would change at some point in our lives, although, God did see us through them. We learn from them and move to the next stage of our life. There are so many things that would be great to not have seen. Like the Titanic sinking, with many lives lost. 1890's - Prince Albert and Queen Victoria live a long and happy reign together until the day she died. 1960's - The Bay of Pigs Invasion is successful. Also, that Fidel Castro is assassinated by the CIA. 2003 - Andrew Lloyd Webber casts Michael Crawford in the film version of "The Phantom of the Opera". Sigh. Hmm, I wrote a perfectly nice comment about Tom Lefroy and Pocahontas, among other things, but I'm having the same problem I had yesterday -- I'm getting a "Server Error" message when I hit "publish." So I'm going to give this one last try but I wanted to say great post, Lisa! So much fun. Brave post Lisa! It has a sort of It's a Wonderful Life feel to it. Thanks, Louise. Of course it's easy for us to look back at the holocaust and appreciate Corrie Ten Boom's example. Not sure if she would have chosen to lose her family and experience Ravensbruck in order to be an inspiration. But she may not have wanted to undo things even if she could, because of the relationship she developed with God because of it. Thanks April, glad to see you around the Inkwell! Some things seem so senseless in retrospect. 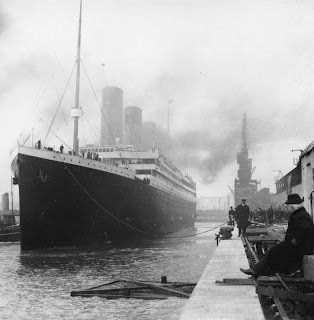 There were so many ways the Titanic disaster could have been avoided, for example. Alexandra, I'm with you on your whole list! Susie, now I want to know what you had to say about Tom and Pocahantas. But I understand, I've been getting that Server Error message too, on and off. I've taken to copying, my comments before I try to post them. Cheryl, I think that would pretty much be the ultimate wouldn't it. But if it hadn't been Adam and Eve at that moment I have a feeling it would have been someone sooner or later! - stop Marc Lepine from walking into École Polytechnique de Montréal (an engineering school) on the afternoon of Dec 6, 1989 and murdering 14 women and wounding 13 other students. His suicide note stated he was fighting feminism and women in non-traditional roles because he blamed feminists for ruining his life. "Jack Layton co-founded the White Ribbon Movement in 1991 to remember the victims of the massacre and protest against violence against women. "Until Montréal, most of the discussion was introspective," Layton recalled in 1999. "Then the massacre happened, and it got us off our butts. My head exploded that year. 'What must it be like for women?' I thought. It was time to speak out and own up to this behaviour." "Eight years later," writes Hurst, "the cause has spread to a dozen countries around the world. Its comprehensive curriculum on gender violence -- taught at public, junior high and senior high school levels -- is used in 100 schools across Canada, 1,000 in the U.S."
And so although I wish they hadn't been murdered, how can I wish it hadn't happened if it's saved so many more lives? How do we weigh this? It's like saying I wish Jesus didn't have to suffer and die on the cross. But because He did, millions have been saved. Good points, Anita Mae. I actually agree with you, But to play devil's advocate, is it really quantifiable? How do we know that any of those classes and discussions saved a single life? After all, the sort of people who would embrace those classes or take them voluntarily, are ones that were already against violence. People like Lephine would use such classes as more proof of where the world went wrong. But as for a death that made a unquestionable difference in the world. You nailed it. I purposely stayed away from mentioning Jesus, but he's the primary example of a life we would wish had been spared, and yet without his sacrifice none of us would have hope. Susie, the Tom and Pocahontas thoughts really set my brain in motion today! Lots of great comments, Lisa. It's true that all the stuff I'd like to change have made me who I am today, but maybe it's the smaller stuff that I'd like a Do Over with, when my kids were younger! April 6, 1814, Napoleon killed by disillusioned countrymen. November 4, 2008... Oops, not supposed to make political remarks. Changing anything in history would have a butterfly effect, though. Once upon a time, when she still wrote decdent books, secular author Johanna Lindsay wrote a time travel where the h/h changed a few things like the SAxons won the battle of Hastings. The consequences were world-changing, so they had to go back and fix things... Many people hated that story, but I remembered loving it because it's so true that we don't think how the world would be so very different if any one of these things hadn't happened. April, ncie to see you here. By the way. Glad to see you here Laurie Alice! Thanks for stopping by. It's my personal theory that even with time travel it would be impossible to change the past. Because all our frame of reference is built on what happened. Even if you traveled back and did something, that change would already be accounted for because what you did was in the past. I'm not sure that makes sense, but I understand it in my head, just not sure I can articulate it!! Interesting, Dina. If there were a separate reality, but the original one would remain as well, what would populate the new reality? I mean from a theological standpoint, would there be some new creation? Yeah, I don't think any time travel theories actually hold weight theologically, since we're all supposed to have one chance here on earth to make our decisions for eternity. That makes sense, Dina. I can see going forward, but then not being able to get back. Now that could be an interesting novel premise. No ever going back to the comfy, security of what we're used to. Yes, basically the way to go forward in time is to travel faster than the speed of light, or travel to a different place where time moves at a different speed. But if we could do that, there would be no going back. We'd return home at some point in the future and be stuck there. Welcome, Guest Blogger Author Jody Hedlund! Welcome Guest Blogger Author Kathi Macias! Welcome, Guest Blogger Author Leanna Ellis! Do You Suffer from TBR Syndrome? Welcome Bethany House author Lisa Wingate! Welcome, guest blogger Shelley Shepard Gray! Who Pays for that Higher Education?